Alumnus Christopher Foley is set to screen his new film about the life of Father Augustus Tolton, the first African-American priest ordained in the United States, this coming week in Nashville, Tennessee. 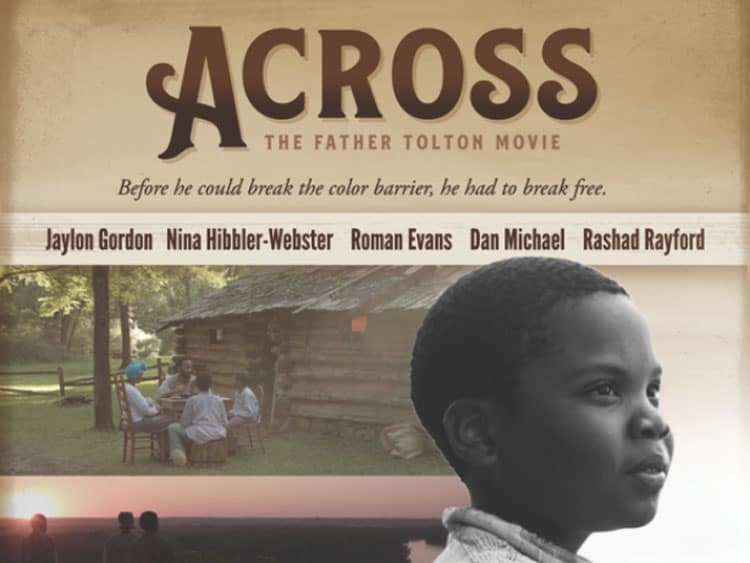 The short film, titled Across, which covers the Tolton family’s escape from slavery, is a labor of love for Foley, who hopes the film’s message of faith, tolerance, and perseverance impacts both Catholics and non-Catholics alike. Alumnus Christopher Foley (far right) directs a scene from “Across” (credit: AcrossMovie.com). Foley, who earned his history degree from Christendom in 1994, has been working in film and television for many years, from independent companies to bigger organizations such as Time Warner and Country Music Television. When Foley first heard about Fr. Tolton’s life, he knew it was a film he wanted to make and partnered with his friend and late alumnus Matthew Cameron ‘93 to bring the story to life. According to the film’s website, Across covers a pivotal moment in the boyhood of Fr. Augustine Tolton. At 10 years old, Fr. Tolton was a Missouri field slave, whose father fled their plantation to go fight with the Union in the Civil War. Fr. Tolton, along with his mother, brother, and infant sister, escaped from the plantation to achieve freedom, and outran the plantation owner and slave-catchers along the way. The poster for “Across” (credit to AcrossMovie.com). Foley and Cameron filmed the production in 2017 in the actual places where Fr. Tolton lived, including in his childhood church, the fields where he worked as a slave, and on the Mississippi River that he and his family crossed to escape to freedom. If the short film is successful, Foley hopes to turn it into a 2-hour film covering the rest of Fr. Tolton’s life, including his struggles with pursuing his vocation and his hard work ministering to African-American Catholics in the United States. Fr. Tolton is currently a candidate for sainthood. With post-production complete, Foley will screen the film in the Diocese of Nashville this coming Sunday, February 17, at the Catholic Pastoral Center, as part of the diocese’s commemoration of Black History Month. The premiere was organized by alumna Joan Watson ‘06, who works as the director of faith formation for the diocese and sees Fr. Tolton’s story as a beacon in the long Civil Rights struggle in America. After the screening, there will be a panel discussion with Foley, lead actress Nina Hibbler-Webster, and Deacon William Hill, an expert on the history of Catholicism in the black community of Middle Tennessee. Across premiered last spring and has been screening at film festivals over the past year, including at the San Francisco Black Film Festival and at the Franklin International Independent Film Festival. For more information on the film, please visit acrossmovie.com.